Oh no it’s the invasion of the soft scale insects! What are soft scale insects? There are many species of insects that are referred to as “soft scale” including: kermes scale, cottony maple, fletcher, and calico, and they mean bad news for your home. Soft scale eggs start hatching in mid to late June. They typically hatch on a twig, and then make their way to the underside of leaves where they can feed off of plant sap. When the leaves begin to fall they move back to the twigs where they hibernate for the winter months. 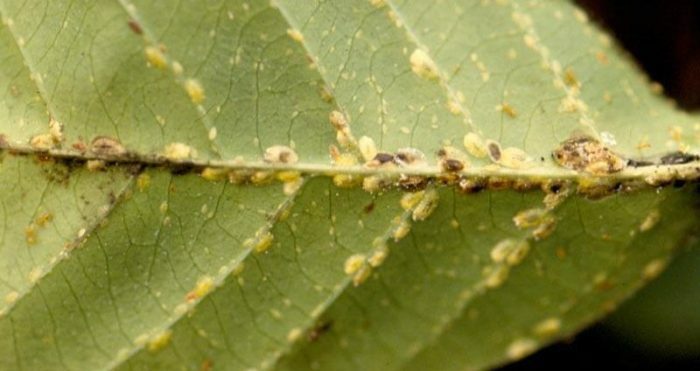 Why are soft scale insects a problem? After the insects feed on the sap of your tree, it passes through their body and drops to whatever lies below. If you park your car under tree branches, you might be wondering why your car is dotted with amounts of sticky sap. This sap is hard to clean off of cars, and may ruin your paint job. This goes for anything that sits below your tree branches including your patio floors. Furthermore, if your tree is already “stressed” due to other conditions, too many soft scale insects can cause major distress. To find out how you can diagnose whether or not your tree is infected by soft scale insects, contact McKinley & Associates today. A certified arborist can diagnose your tree, and provide suggested treatments. There are several ways to manage your soft scale infestation problem. Contact us here or give us a call at (818) 426-2432 Today!